Match-grade accuracy? Check. Manufactured by one of the most esteemed arms and ammunition companies in the United States? Check. 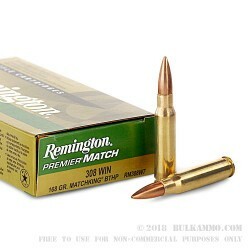 If you are after an absolutely unstoppable match cartridge, try this 308 Winchester by Remington Premier Match. Topped with a well-balanced 168gr hollow point boat tail (HPBT) MatchKing bullet, this .308 Win ammo maintains its velocity and provides pinpoint accuracy at several hundred yards. 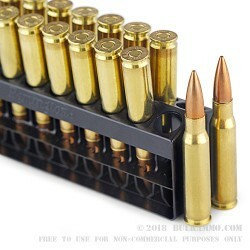 Each round in this bulk case of 200 has a Boxer-primed brass casings, Boxer-primer, and optimal powder load designed to generate the most consistent performance possible. The casings are new-production, non-corrosive, and reloadable. Only better ammo would be handloads. I really wanted a tactical sniper rifle since I was alot younger. Finally got one about 3 months ago and needed ammo to shoot. Got this ammo and all I can say is this is the real deal. Accurate, clean, and consistant. I just shot half inch groups with a NEW, not broken in rifle. Quickly sent and arrived less than 5 days to San Diego. I will order more to use in the firefighters olympics! Q: Does BTHP mean boat tail hollow point? Does HPBT mean hollow point boat tail? Thank you. 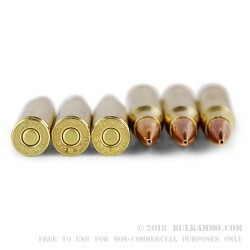 A: Hello Ray, Yes, 'BTHP' does stand for Boat Tail Hollow Point, like with these 168gr. 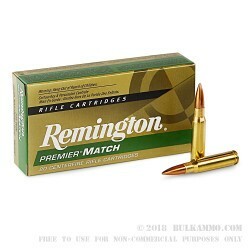 rounds by Remington. 'HPBT' does stand for Hollow Point Boat Tail. Some manufacturers will arrange it one way and some the other, but they both describe the same projectile design.